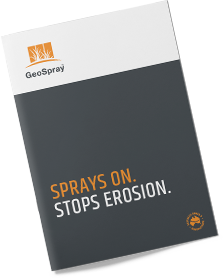 Stop erosion caused by water, rain or wind with GeoSpray – an alternative to geotextile products created by EnviroStraw. Unlike other erosion-control solutions, GeoSpray is applied in minutes – not hours. It dries quickly and can withstand moderate rain events in as little as 4 hours after application. Developed by Australia’s leading soil scientists, GeoSpray is proven to perform well on all substrates, including compacted clay, rock, sandy loam and dispersive soils. Australia’s leading soil scientists and agronomists developed EnviroStraw as a self-sustaining alternative to compost and other amendments. There are 4 revegetation solutions in the EnviroStraw range. Product selection depends on slope and site requirements, with each solution combining various key ingredients to quickly establish vegetation. Envirostraw is a Member of the International Erosion Control Association. EnviroStraw received an award for innovation from the International Erosion Control Association (IECA) in 2015 – the United Nations’ ‘Year of Soils’. 2019 © EnviroStraw | All Rights Reserved.